The Tatar ethnic group in China has a population of about 10,000, most of whom live in the towns of Yining, Tacheng, and Urumqi in the Xinjiang Uygur Autonomous Region. The Tatars historically named the "Dadan", are descended from a branch of a Mongolian tribe, who used to inhabit the region near the Volga River. From the beginning of the 20th century, the Tatars gradually settled in Xinjiang. Most of them were occupied as merchants. The Tatar nationality has its own language, which belongs to Turkic branch of the Altaic language family. 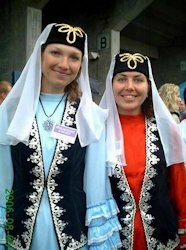 However, as a result of frequent contact with the Uygur and Kazak people, the Tatars also use Kazak or Uygur language. The Tatars' written language is based on Arabic letters, but now they often also use Kazak and Uygur characters. Most of the Tatar people are adherents of Islam. Tatar cuisine includes scones, zhuafan, pastries, beef and mutton dishes, as well as various vegetables. Meats from pigs, donkeys, or mules are forbidden in their diet. Tatar drinks include the beer-like "keerxima", which is made from fermented honey, and 'Kesaile", a wine brewed from wild grapes. Tatar men usually wear embroidered white shirts, under a black waistcoat or black robe, with a black or black and white embroidered hat. Young people like to wear peaked caps, and long leather shoes. Women wear white, yellow, or amaranth pleated one-piece skirts as well as small hats, with a short 'veil' covering the back of the head and neck. 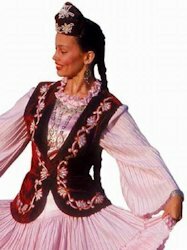 Tatar people have strong sense of musical rhythm. Their music is full of grassland sentiment, and is accompanied by accordion, mandolin, and violin, etc. 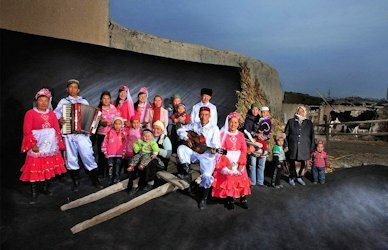 Tatars celebrate their "Saban Festival" (plowshare festival) each year after they finished their spring plowing. Tatar people also celebrate Corban Festival, Almsgiving Festival and Kaizhai Festival in line with other Islamic believers. Their favorite sports include wrestling, horse racing, and tug of war. The Tatar are Islamic Turkic speakers and farmers. Their diet includes round cakes, with the outside crisp and the inside soft. They also eat cheese, dried apricots and rice. They mostly live in the Xinjiang Autonomous Region.